02.10.2014, Books, by Jack W Perry. Google just surpassed Exxon-Mobil to become the second most valuable company in the world. Only Apple is worth more. I hadn’t given it much thought. But it is a significant day. It is the shift from the former owners of the global economy (energy and big oil) to the new ones (information). It’s not the final shift, but a big one. The fourth biggest is Microsoft and the fifth GE. I use Google every day, hours a day. Google has a roadmap to the “on-line life pattern” for most everyone. They know everywhere you have been and store it on some cloud out there – forever. All searchable. That’s why they are so valuable. I like to read business histories. But have not read a lot on Google. Then I was stumbling through some old hardcover books, looking to see what to give to the library. 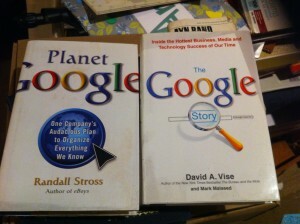 I came across two books on Google. I had meant to read about Google but never did because the company was growing so fast; I felt the hardcover was out of date immediately. Google was growing too quickly. But now I am going to read these books as history. They are nine and six years old. They look like good reads. Maybe by understanding more of the history (without the knowledge of how the company would continue), will be able to understand the past. Keep the Pipeline Full CREATIVITY, INC.